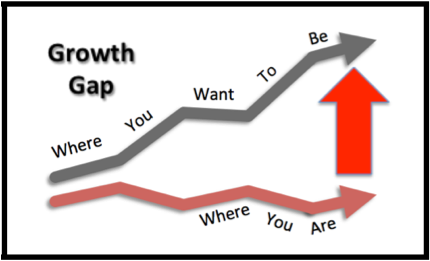 When it comes to sales, if there's a gap between "where you are" and "where you want to be", JV/M - through it's LeadGen.com family of services - can help. But before we talk about how we can help though, it first helps to understand the kinds of problems we can solve. This is because considering a solution is predicated on there being a problem - in this case a gap between "where you are" and "where you want to be". As you can see below, there are two kinds of problems that can exist for a business: a Growth Gap or a Trouble Gap. 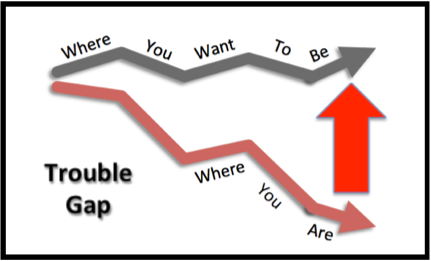 These kinds of gaps - or differences between "where you are" and "where you want to be" - can exist with regard to any business goal, including sales, profitability, market share, stock price or payback. But they can also apply to subjective goals such as quality of life, career advancement, or job fulfillment. 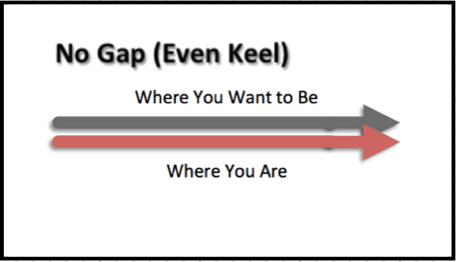 Regardless, the "gap" basically describes a situation where you have a goal, but you're just not reaching it. In the first case, a Growth Gap, you're doing okay, but you want to do better. In the second case, a Trouble Gap, you're doing poorly, and you need to get, at least, to the point where you're doing okay. To be clear, there are certainly situations where either you don't have a gap, or where you don't believe you have a gap despite evidence to the contrary. And in those cases, you don't need our help. The first situation is called "even keel," and it's illustrated below. In this case, everything's fine, and you don't need any help. You're on an "Even Keel." And unless you want to raise the bar, you probably don't need our help. The other case, where you also don't need any help, is where you think you are doing better than you really are (i.e. 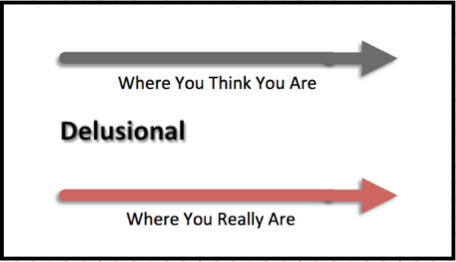 you're "Delusional"). And unless you want someone to checkpoint your analysis, we're again not the ones to call. But if there's a gap between "where you are" and "where you want to be" with respect to sales, market share or profitability, that's where we can help. And that's when and why you should consider LeadGen.com. But first, you're probably thinking: Why not just do it in-house? Once you've concluded that there's a gap between "where you are" and "where you want to be," you'll need to figure out how to solve the problem. If you know how to solve the problem, and you have the skills and resources in-house, you don't need outside help. But if you don't know how to solve the problem, or you don't have the skills or resources to solve it, you need to seek help from an expert. Maybe us, or maybe someone else. This question of knowing how to solve the problem, by the way, is a lot more important, and potentially complicated, than you might think. For example, let's say you're not hitting your sales numbers. Is it because not enough prospects know about you? Is it because they're already working with your competitor? Is it because your solution lacks adequate value? Maybe people just don't understand your value? Or maybe your salespeople just can't close. If you don't understand this real problem, then any solution - whether in-house or outsourced - probably isn't going to work. But one reason to outsource is to get a fresh perspective on the problem, and thereby come up with a viable solution. Obviously, if you just start searching for particular solutions like telemarketing, SEO, PR, SMM or SEM, you've really biased the result. But you get the point. At LeadGen.com, we can figure out what the problem is, without bias, although we may not be able to do it without working the entire sell-cycle (see below). At LeadGen.com, we don't presume what the solution is. We first try to figure out what the real, underlying problems are, and then propose (based on our extensive experience) what we think could solve it. If you agree, we'll implement the solution, and then we'll look at the results. If the results improve, we'll scale up. If not, or they don't improve enough, we'll use the new data to improve our diagnosis, and try to come up with a better solution. NOTE: Improving sales results is, by definition, an iterative process. This is because the bar is (or should be) raised continually; and market conditions change constantly. Therefore, our process is designed around the USAF's Observe - Orient - Decide - Act (OODA loop) concept. At LeadGen.com, we care about your entire sell cycle - from identifying market opportunities to account retention. While we do not do commission work, we measure our success based on your profitability. Ultimately, we believe that we offer the most cost-effective solution - assuming you don't know what the real problem is, and you don't have the capability in-house to solve it.